Unlike most Gallente ship manufacturers, Roden Shipyards tend to favor missiles over drones and their ships generally possess stronger armor. Their electronics capacity, however, tends to be weaker than that of their competitors'. 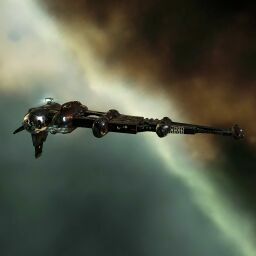 The Eris is the Gallente Interdictor. An interdictor's primary purpose on the battlefield is to drop bubbles to keep enemies from fleeing into warp over a wide area. The Eris has received a new lease of life since Rubicon got rid of its split weapons. The Eris is now a capable blaster or railgun boat, and when blaster fit is the interdictor with the highest possible DPS (though this is dubiously useful, since this usually isn't a priority for interdictors). With its two mid slots the Eris is almost exclusively armor tanked, which makes it a rare sight in large fleets since fleet interdictors tend to be shield tanked for speed. Further information about additional or recommended skills to pilot Eris for a specific or it's common role(s) can be written here. This page was last modified on 3 December 2018, at 05:30.